I had a chance to catch up with updates at Solibri, which develops the model-checking application, Solibri Model Checker, reviewed in AECbytes last year. Solibri Model Checker allows checking BIM models for potential problems, conflicts, or design code violations, and also includes visualization, walkthrough, interference detection, model comparison, and information takeoff capabilities. Solibri recently released version 8 of the application, which features enhancements to the BIM-based quality assurance and quality control (QA/QC) capabilities that are the heart of the application, by automatically selecting the most relevant tasks and required rulesets for a selected QA/QC role. The new version also includes an at-a-glance assessment of the quality of the model with a new “Result Summary” view that measures the “issue density” of the model, as well as the ability to customize the rules that are using for model-checking. It is now possible to modify a rule, then immediately use the modified rule for model checking. There is also some COBie support—COBie data can be imported into the information takeoff module of the application and then visualized (see Figure 9). In addition, some COBie-specific rules can also be created. Solibri also recently announced a $21 million grant program that North American Authorities Having Jurisdiction (AHJ’s) can use to acquire Solibri Model Checker technology and receive assistance in incorporating BIM into the digital review process. Another application that I hadn’t come across before was dRofus, which is a cloud-based tool for space planning, program validation, and data management, making it somewhat similar to Trelligence Affinity, the only dedicated solution for programming and space planning in the AEC industry that I had been aware of. dRofus is developed by a Norwegian company which has 40 years experience in the construction industry and has participated in the planning of major hospital projects in Norway. 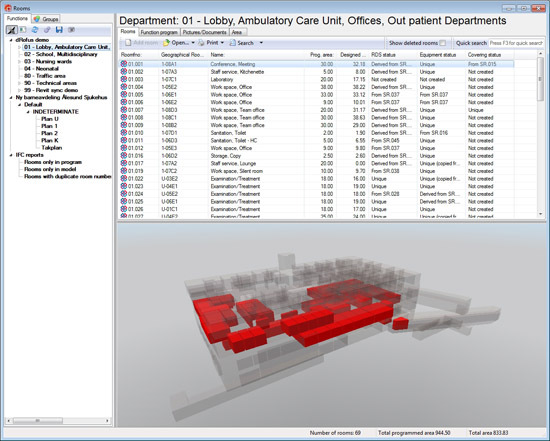 dRofus was originally developed as a planning system for large, complex hospital projects, but over the last 10 years, it has been developed into a flexible, project-independent application that can be used for all types of building projects, regardless of their complexity or size. It is used in many projects in Norway, Sweden, Denmark, and The Netherlands, and is starting to gain traction in the US as well, with adoption by leading firms like HOK. 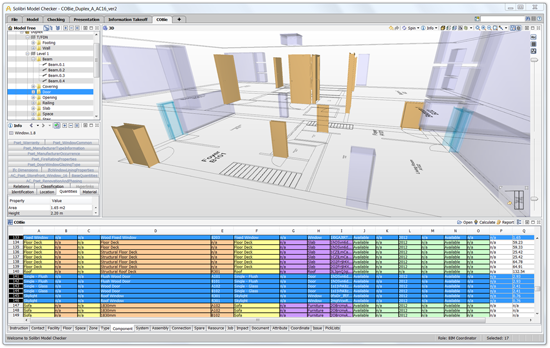 In addition to the planning and mapping of areas, rooms and functions, dRofus supports key business processes including Room Data Sheet (RDS), registration and monitoring of the requirements for each room; FF&E (Furniture, fixtures and equipment) planning, cost control and procurement; and visualizing and checking the designed model using the IFC file format (see Figure 5). Not only can the program check the designed model against the programmed requirements, it can also enrich the IFC model with the requirement data that has been input into dRofus. And because all the data is stored centrally on the cloud, everyone involved has access to the most up-to-date data at any time. Lachmi Khemlani is founder and editor of AECbytes. She has a Ph.D. in Architecture from UC Berkeley, specializing in intelligent building modeling, and consults and writes on AECtechnology. She can be reached at lachmi@aecbytes.com. This entry was posted in BIM Conference, BIM Software, IFC and tagged AECBytes, Solibri on February 13, 2013 by rumbelom.